Jackie is a visual artist based in County Durham, working in all mediums from painting to pottery. Jackie is an integral part of the art community within Bishop Auckland and has worked closely with Tom on the Pineapple Gallery. Based in Nidderdale, North Yorkshire, Karen uses the stunning views of the surrounding area as inspiration for her work. Karen aims to capture the colours, shapes and textures that are formed in landscapes through changing light and shade or differing weather conditions. Amberlea is a ceramicist who has used her diverse training to hone her skills on the wheel, finding a unique and communicative visual language by intricately hand cutting patterns directly in her pots. Having trained internationally, Amberlea now works from her studio in Sheffield. Fiona is a Yorkshire based ceramic artist who uses nature to form the basis of her work. With a particular interest in butterflies, Fiona uses various techniques to capture the beauty of this insect, with Raku being the main technical process to create subtle effects to enhance the delicate forms. Albert specialises in throwing large multi-part pots exclusively in porcelain and on the application of oil spot glazes. Influenced by classic Egyptian vessels, Albert takes extraordinary satisfaction in combining these specialisms to create impactful, statement pieces. Michael is an artist-printmaker who creates limited edition etchings, lino prints, fine art books and wood engravings from his home based workshop and Bracken Press. His works are figurative, narrative and located in the Yorkshire countryside. Brian has honed an ability to express his physical, tactile and spacial experiences by responding to the capabilities of clay. Be it sculpture or vessels, Brian’s work is inspired by the overall feeling of life and is responsive to the surroundings that bring life to the fore. Clare is a papercutting artist who captures the wonder of trees, birds and animals in her intricate work. Using the natural world as inspiration, Clare draws and cuts her work by hand, without the use of computers. Gloriana is a keen walker and experienced sailor. They have cruised extensively in the North Sea, Channel and Western Isles of Scotland in their boat French Melody. Gloriana usually had a pocket camera with her and decided to take up photography, completing a series of courses at Darlington College and now mainly concentrates on outdoor photography. 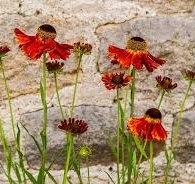 She is drawn to the colours, textures and shapes of the natural world and captures images of plants and wildlife. The son of a blacksmith, Steve works in the family smithy on a roundabout in north Yorkshire making detailed sculptures of birds, plants and more exotic designs from metal, some recycled. He exhibits throughout the north of England and has been commissioned for public art. I’m a visual artist specialising in painting, in particular colour-led abstraction. I studied painting at the Glasgow School of Art and later as a post-grad at the University of Hull. My current work explores colour, gestural mark-making and ideas around abstraction and representation. I’ve exhibited nationally, and my work is in several private collections. Working across media and genres, I have developed ideas through textiles, graphics and fine-art. I enjoy being able to move between media and not be bound by any particular one. My grounding in the academic skills of drawing and painting allows me to play between techniques and methods, avoiding repetition and predictability in my work. My work is not thematic- and is very much based on the studio process of being led by the materials themselves. My interests, life and environment – no doubt – influence what I do. I see the world around me as shapes and colours, offering endless visual possibilities. 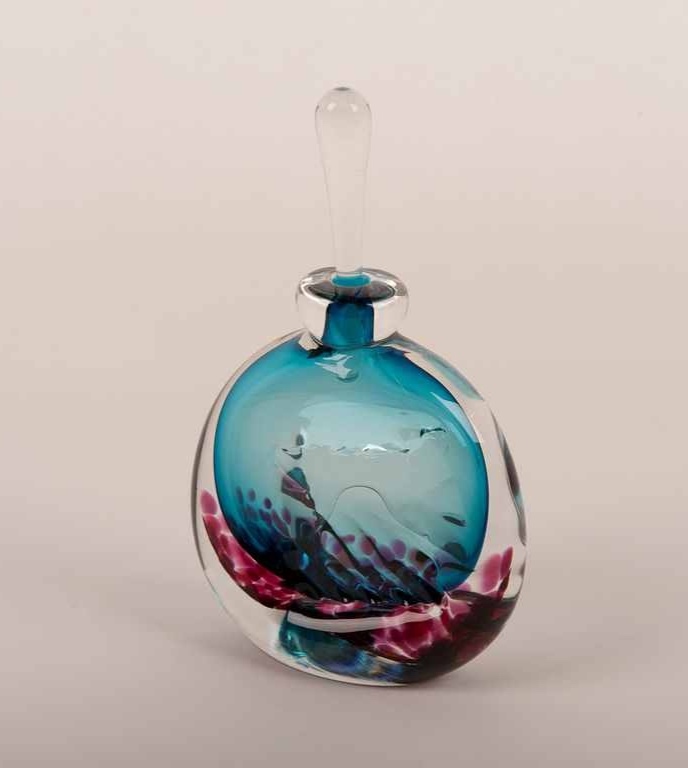 Newcastle glass artist began as a ceramicist studying ceramics at N.Staffs Polytechnic in 1980, but became interested in the technique and comparative speed of working with glass rather then clay. She then worked her ‘apprenticeship’ for three years in Dudley, near Stourbridge, the heartland of glass and around the country. Jane first went solo with the Jane Charles Studio in Edinburgh in 1987 but completed her move to Newcastle in 1966, where she is now based. I'm a ceramicist from Masham in the Yorkshire Dales. I make hand-built ceramics using porcelain & stoneware clays, to create both functional & decorative items. My work constantly reflects the past in some form; as i'm an avid collector of vintage items and has a fascination in researching times past. Recent work is decorated with symbolic pattern, mapping ancient roads, places & the surrounding Yorkshire landscape. Born in Chester in 1973. Nathan grew up in various places across the North West, including Salford, Greater Manchester and Warrington. Nathan studied Fine Art at Liverpool John Moores University from 1993 to 1996 specialising in painting. He later stayed in Liverpool and is still based there today and currently has his studio with Dot-Art in Burlington House, Waterloo (just outside Liverpool town centre. There is a fundamental need for me to create a bridge for which words can not be found. There is a compulsion to make, and for me making paintings somehow seems the way forward. My subject is 'life'. I am interested in colour, and I want my paintings to be confident, positive and vibrant. I prefer to produce more abstract work but the marks and shapes still tend to produce associations nonetheless. Associations are produced like glimpses without always being totally direct in realistic or figurative terms. I also love music, and the feelings I get from it, and part of what I want with my work is for people to get the same feeling from looking at my painting that I do from listening the music that I like. Maggie is both an artist and musician, having grown up in a house filled with music and dance, later specialising on the piano and viola and played chamber music in string quartets. Diane’s painting work is informed by her musical life, as seen in the titles of many of her works. She has exhibited with the Society of Women Artists in Westminster and the Mall Galleries for many years and the Royal Society of British Artists annual exhibition also in the Mall Galleries. “For me it is all about looking, learning, studying and practising. I have been on many courses and studied with some renowned tutors but I seriously needed to find my own path, make my own mistakes, struggle through the frustrations, and seek out the relevant information and inspiration as it was required and I have been on this journey for many years. I continually strive to create each piece of work with that indefinable ‘Maggie’ expression that I hope gives life to each piece created in ‘The music of the landscape’." Florencia Troisi lives in Cordoba, Argentina and is a freelance artist, starting as a traditional artist doing drawings with pencils. She now works as an independent artist, an illustrator and creator of public installations. Her work celebrates Latin American culture and explores themes of childhood, the feminine and ancient mythology. John lives and works on the edge of the North Yorkshire moors, where he uses the landscape to inspire his large scale abstract paintings. Utilising traditional materials, John reinterprets this classical theme with a modernist approach. 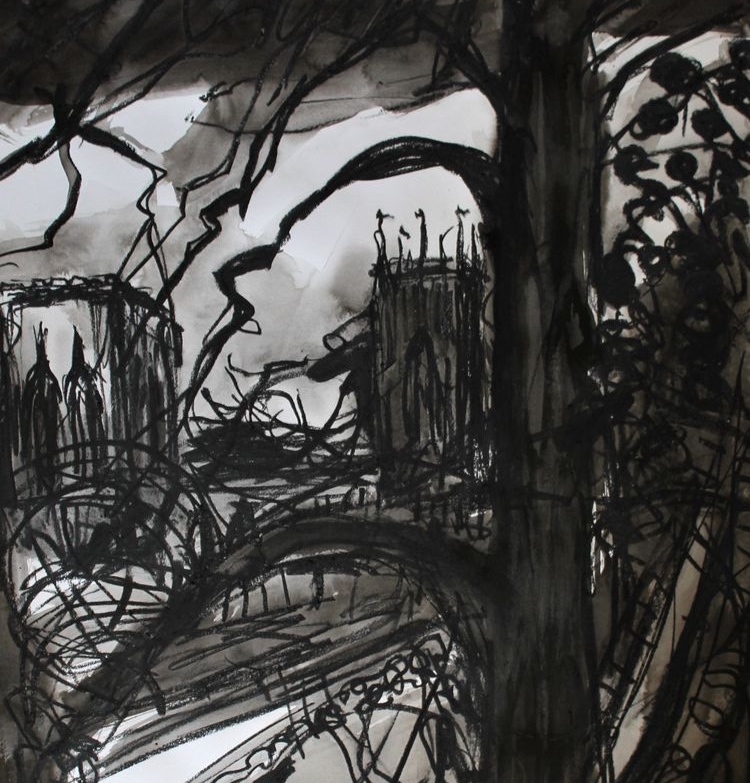 Andrew works from his small print workshop in Thirsk, North Yorkshire, discovering new approaches to expressing his fascination with black and white and its ability to convey a figurative or abstract representation of a personal narrative. Adam is a painter and printmaker, living and working in both Harrogate and Scarborough. He responds to his surroundings through representation of the architectural and natural world, using a range of media and techniques. His latest work is deceptively simple, demonstrating a sureness of composition and brushwork. Sally’s ceramics are derived from various influences, built on memories and experiences from her own life as well as the rich history of ceramics in society. The robust forms and external decoration of her dark stoneware contract with the bright and highly decorated interiors. Alyson is a painter (turned primary school teach turned artist!) who lives and works on the Yorkshire/Lancashire border. Inspired by the everyday, Alyson uses anything that catches her eye as the subject of her work, with her current pictures focused around nature. Elizabeth is a mixed media artist inspired by the landscape of her home in the Lake District and her preferred holiday destination in the Hebrides. Elizabeth uses her images to create collographs and etchings which are used across a number of contexts. 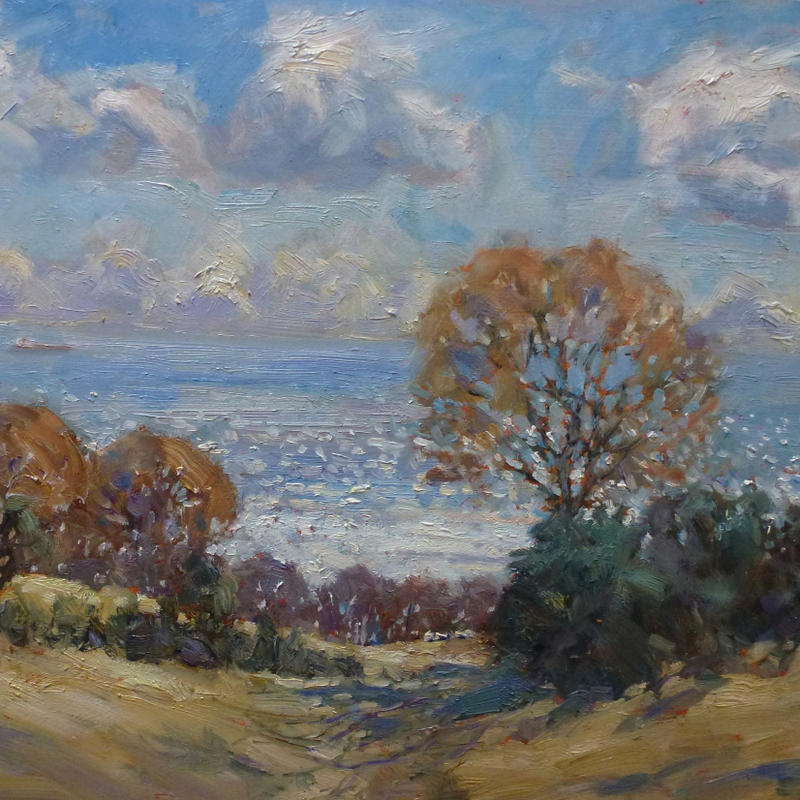 Christine is an artist working in both oils and watercolours, with a particular love of painting plein-air seascapes, landscapes and snow scenes. Whilst home is Whitby on the North Yorkshire coast, she travels extensively to work, including to New Zealand, Australia and throughout Europe. Denys is a Sculptor who uses driftwood as the basis of its work, combining the interesting colours, textures and shapes to create unique sculptures. Her work is often equine in nature, coming from a local North Yorkshire farming family. Malcolm Taylor is a member of the Manchester Academy of Fine Arts lives in the North West of England and paints across several media, acrylics, oils, pastels and collages, painting landscapes, still lifes and abstract work. He has exhibited widely across the UK , including the Royal Academy Summer Show and the Mall Galleries in London. 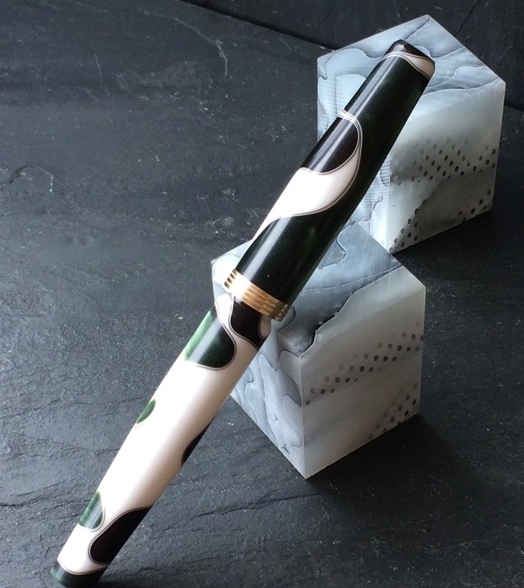 Often using expensive materials, including gold leaf, and working with a slide rule and lathes and avoiding computers and other modern methods, Rob makes handmade fountain pens of the highest spec and levels of precision of a quality not found on the high street. His influences are the Japanese art of pen making and working with exotic materials. Louise Bradley studied and works in Newcastle upon Tyne. Her work explores drawing, printmaking, paper cut and painting as well as digital media. She works initially directly from life and nature, focusing on line, structure, emotion and symbolism to create a powerful presence of the subject, whether it is a portrait, figure or still life. Recent work has been developed by making automatic drawings which are drawings made without looking at the drawn surface, often with the paper stuck on the underside of a table. Subjects are chosen for their organic sensual qualities. Simon was born in 1959. He studied History of Art and English at Nottingham University before going on to the Byam Shaw School of Art in London to complete a Diploma in Fine Art in 1985. Since then he has exhibited widely in this country and abroad, including a mixed touring show to Moscow and other Russian cities. His work featured in the 2004 mixed exhibition at the Dean Clough Galleries in Halifax and the ‘Into Abstraction’ exhibition at The Mercer Gallery in Harrogate (2008). In 2001 he won the Sir Hugh Casson drawing prize at the Royal Academy summer exhibition and the 2008 Jerwood Drawing prize. He currently lives in North Yorkshire and is married with 2 children. His paintings and drawings reflect a passion to depict the human form, or parts of the figure, as well as references to interiors and landscapes. He combines these elements in an amalgam of forms sometimes using an economy of line in his drawings, or more luscious use of paint to represent both the essential characteristics of figures and the ripeness of subject matter. Charlotte and Sigi are based in Hohr-Grenzhausen, Germany, a town dedicated to ceramics. Working in stoneware they make ceramics in new colours fronted-burning stoneware clay. 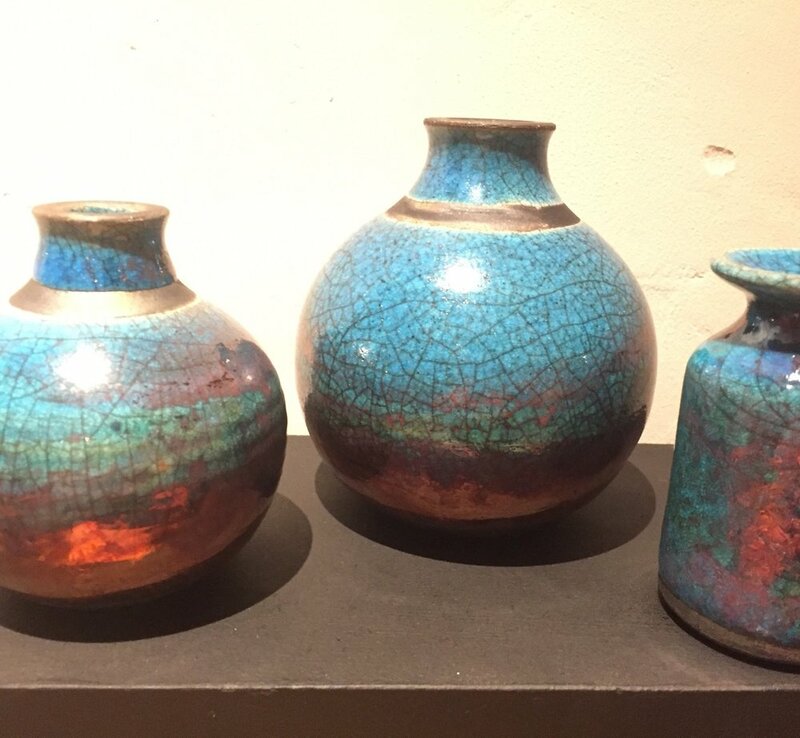 Markus Bohm works at Lake Mueritz Pottery in Germany has developed a specialism and fascination over 30 years as a ceramicist in glazes, and is a pioneer in developing his own glazes with a combined process of ‘volumetric blending and computer aided glaze calculation’. Although he fires his pots in a wood fired kiln, all of his work is glazed in addition to the effects that wood ash, soda and salt provide. 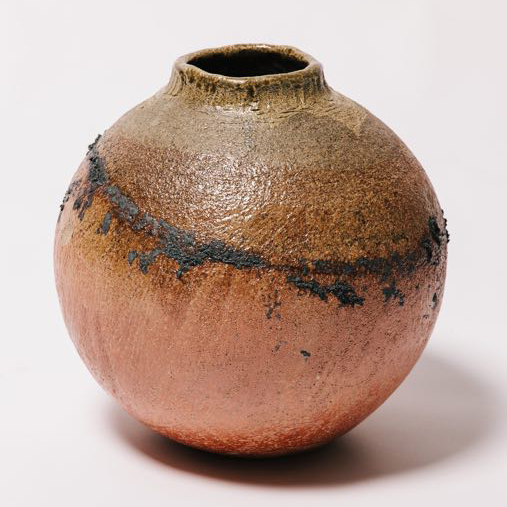 He uses stoneware glazes, but also works in other disciplines such as raku and earthenware. Duncan is the man behind ‘Mutant Art’, working from his studio in the Exchange Mill building in Elland, Yorkshire. Being part of an old working mill provides Duncan with space to work on a number of paintings at the same time which is very much part of his approach to exploring several different artistic routes. Sara is based in Keswick, Cumbria, where she makes modern and unique wares by hand. Inspired by nature and the sea, Sara utilises traditional copper foil and solder to connect beautiful pieces of sea glass which celebrate a host of colours, shapes and textures. Following an interesting career in music, John became an artist unexpectedly through encouragement by his friends. His work is almost exclusively achieved in oils but varies stylistic approach and subject-matter. Sarah Venus is an artist living on the coast of North Yorkshire. 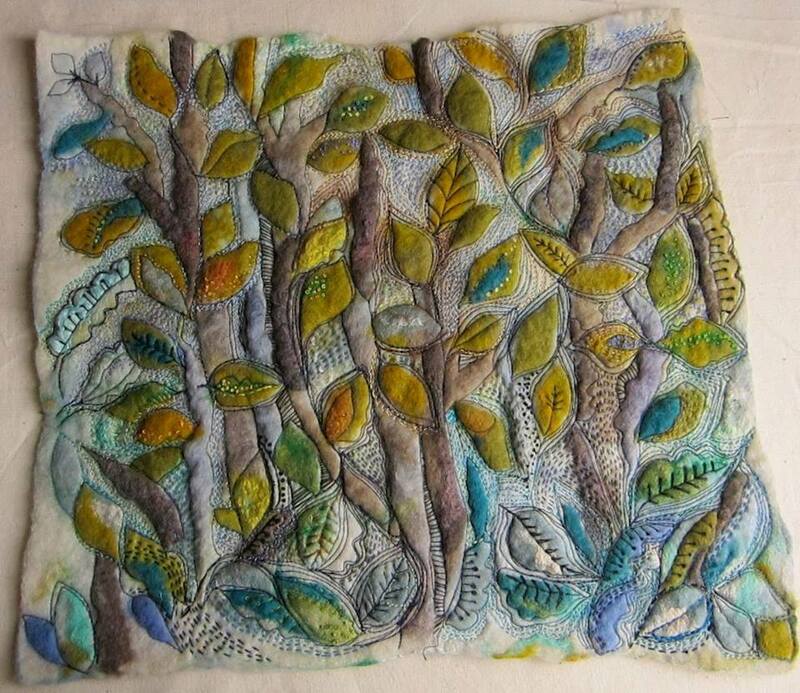 Natural forms and the interaction of elements are a common thread of inspiration that draws a link between her use of printmaking, felting, textiles, painting and collage - as well as other unconventional materials in her work. Drew is a West Yorkshire based artist who uses abstracted architectural subjects and the power and movement of water as the basis of his work. Drew uses charcoal, pastel and conte to capture an area of interest, enlarging it so that the identity of the original is often lost in the finished work. Ben is a York based artist who uses ceramics as an exploration of the way we see. Creating a contradiction between a drawn illusion and what is actually tangible plays a game with the onlooker, setting the prosaic nature of clay against the unlikely structure of the drawings. Josh is a Newcastle based Industrial Designer. His diverse portfolio utilises high and low tech manufacturing processes to work already beautiful materials into useful objects. Working collaboratively and drawing upon a wide range of influences provides a rich narrative to his work. Born in a mining village Alistair Brookes's work is inspired by memories of his early life. Life and traditions found in mining communities provide his inspiration. Living in the Yorkshire Dales Alistair says that he finds the rural life full of characters. Raku pottery is Alistair’s chosen media as he likes the spontaneity and surprise in its results. His designs are created with a firing process that uses both fire and smoke to create unique patterns and designs. 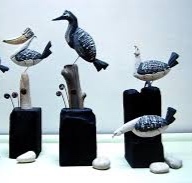 Susan is a member of the British Toymakers’ Guild and works chiefly in wood. 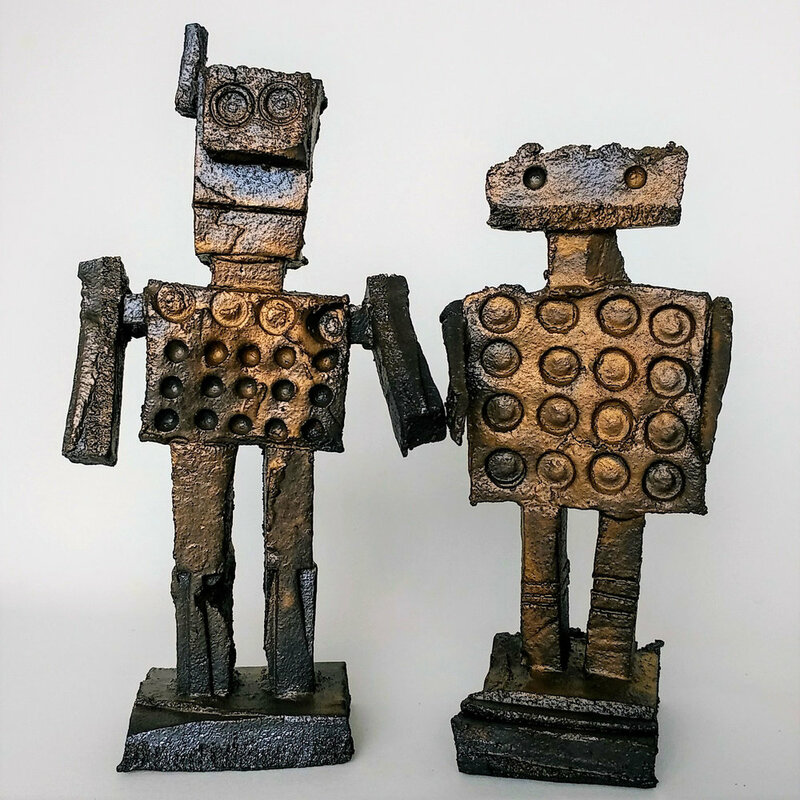 Among her sculptures, she loves to make quirky mechanisms that involve cranks, cams and levers in various woods and her toys are intended originally for adults. Her interests in wood, the sea and nature and in international folk art and medieval and romanesque carvings combines in her work a knowledge of art history with a sense of fun. Susan exhibits widely throughout the UK. Susan Wheeler is an Oxfordshire printmaker who makes linocuts from the inspiration she derives from the landscape, botany and buildings of Oxford and the surrounding countryside. She has exhibited nationwide including the Biscuit Factory, Newcastle upon Tyne, Radley College and at the Oxford Printmakers. This Nottingham based artist uses the recycled rubber of tyre inner tubes to hand cut by eye delicate patterns and items of jewellery. An eco-friendly and cruelty-free process, using recycled materials, the reclaimed rubber serves as a leather substitute due to its similar texture and unique patterns. Previously a workshop leader at Leeds Art Gallery & LSA at East Street Arts, Lees, Amy Hall is a full time jewellery maker at her own business, Red Paper House. Designs inspired by nature are combined with bold colours, geometric shapes and hand illustrated patterns to create jewellery, each item then handmade by Amy in her Yorkshire workshop. Hand drawn designs are laser cut, in the UK, using sustainable birch wood, sourced via fair trade routes. The wooden shapes are hand painted and hand illustrated. Jack studied at Leek College of Art, studied Modelling and Mouldmaking with Ed Bentley as well as working with his father, ceramic artist Tony Laverick. Jack works with translucent slip porcelain, making tea light holders, planters, candle holders, pot and vases and lighting with his combined interests in geometry, photography (which he studied under landscape photographer Dave Butcher). Jack has the touch for delicate clean lines and intricate detail and his work is inspired by his many disciplines in drawing, design, photography, as well as his deep ceramics background. 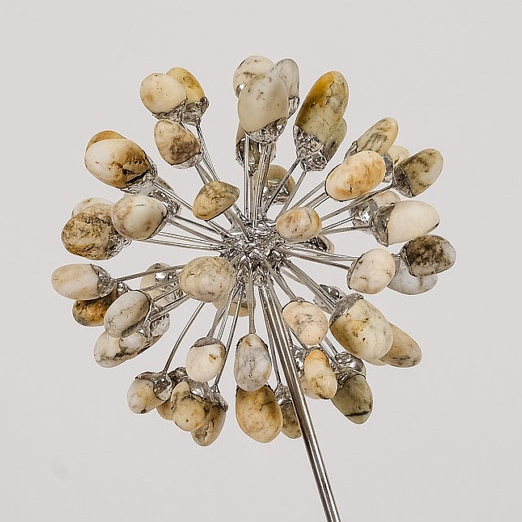 Rock formation, stones and pebbles inspire my ceramic work. rocks and cliffs or the smoothness of pebbles washed by the sea. open to expose glistening colour. allowing them to be displayed outdoors. Juliet Macleod studied at Central St Martins and worked as a graphic designer in London for twenty years. After stopping work to have a family she rediscovered her love of pottery following a course at Gray’s School of Art. Juliet moved to Aberdeen from Devon in 2010. She has been lucky to live in areas of immense natural beauty and this has in turn provided her with a huge visual resource. After a year of discovery and experimentation Juliet now works as a studio potter specialising in contemporary porcelain using traditional slipware techniques. Each piece of work by Mark Smith draws inspiration from the sea, and each as it's own unique appearance and story to tell. Objects found on travels or by shoreline often become part of the work. Mark uses a variety of techniques to achieve the finished look of a piece, focusing mainly on decay and repair. The work is constantly changing due to the materials found, each piece can never be replicated. Ships, boats, wrecks, beach huts and houses are the main focus of the work, all textured with raised and indented objects that have an indication of our industrial past. Andrew lives and works in Scarborough, North Yorkshire, where he has a studio in one of the baiting sheds on the harbour. Andrew has been painting the sea and documenting Scarborough’s declining Fishing industry since 2000. Throughout this time the sea has been a constant inspiration in his work. Rob specialises in wheel thrown domestic ware, generous in proportion with substantial rims and handles that are freely decorated and boast a vibrant colour palette. Many of Robs ideas are influenced by English slipware, and all things Japanese. Julia is an abstract expressive artist, interpreting landscape and emotion through bold intuitive painting. Mainly working in oils, Julia is passionate about colour and enjoys experimenting with different techniques to create exciting textures and surfaces. Anna is a paper artist who creates intricately cut frames of paper to form multilayered pieces of artwork. Anna’s scenes are themed around nature and animals which are captured in the depths of the delicate shapes. Chris works in a converted stable at her hamlet near York, hand building and sculpting her work with coils and slabs. Each piece is textured, carved and painted with a mix of slips, underglaze colours and oxides. 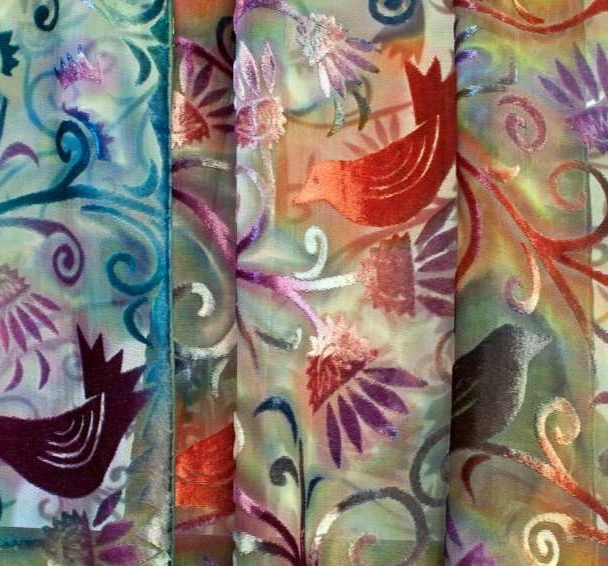 Christine glaze and fires several times to achieve multiple layers of colour. Phil is a Norfolk based potter combining his skills as a former production wheel thrower with the freedom of hand building techniques. 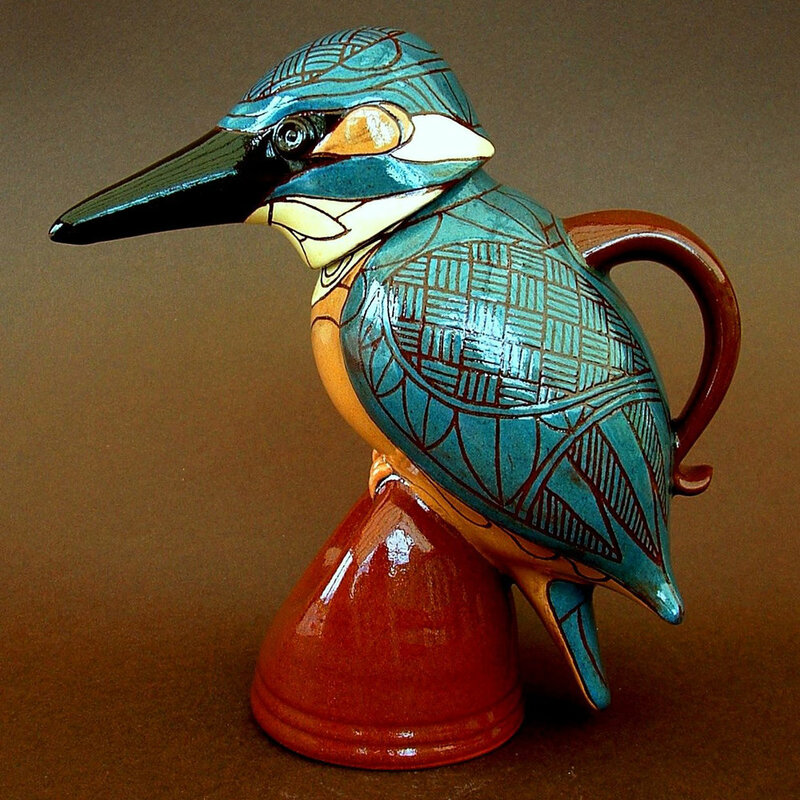 Phil has developed a line of bird and animal pots inspired by 17th century English slipware, Pre-columbian vessels and pots of Picasso - using thrown shapes as a basis for altering and constructing. Elizabeth is a designer/maker who explores the potential of pattern across a number of mediums. Be it textiles or ceramic, Elizabeth loves enhancing everyday objects with decoration, each one unique, each built up over several firings or several sewing and embroidery techniques. Elisabeth uses clay throwing skills developed over 35 years to form simple ceramic shapes as backdrops for free, swift brushwork drawings. She works with hot wax, painting directly on the newly glazed surface, then dipping pots in another colour. During the kiln firing, designs move with the shape of the form, so pot and drawing become one. Inspiration comes from animals and birds she studies, drawing them until a few brush strokes define shape and form. Whilst my landscapes are built on close observation I also like to work in random ways, experimenting with colour and mark making freely. Much of my work becomes a hybrid between the observed and imagined. I am a fine art printmaker working in Brighton England, creating vibrant and sensuous etchings and watercolours. My images are a celebration of dynamic form, colour and playfulness. They are the end result of a creative journey, aiming to inspire the observer's own imagination.As part of Studio B5 Brighton, I have spent the last few years developing Acrylic Resist Etching on steel plates, with impressive results!Most of my newer work has been created with this new process. Have a look at my blog for more information and classes. My work has appeared in a number of feature films and TV series, including BBC's 'The Night Manager' and 'Bridget Jones' Baby'. Karen Thompson was born in the coastal town of South Shields in 1973. In 2004 she completed ceramics qualifications at Kensington & Chelsea College then graduated with a BA (Hons) Ceramics from Bath Spa University in 2008. Thompson’s ceramic work draws on both historic and contemporary influences and frequently explores themes of subversion, satire and humour. Her work is held in private and public collections including The Crafts Council, The Arts Council, York Art Gallery, Scarborough Museums Trust, Bath Spa University and Crescent Arts. Thompson currently lives and works in Scarborough, North Yorkshire. veryday I forage my way thru life & discover new possibilities in which I can document, in the form of paint, onto canvas. I am drawn to the unlikely compositions of northern scenes, such as an empty street, terraced houses or the stark baron landscape of the Pennines. I am a Northern contemporary painter, with expressive aspirations. I mainly use oil & acrylic, pen & ink. Chris studied fine art at degree level at the Manchester College of Art in 1971 and was drawn to ceramics after leaving college. Her work, producing everyday useable objects, is thrown, textured, then thrown again to emphasise the fractured surfaces. Textures vary by applying slips, powdered clay, organic material or by impressing other decorated surfaces. on second throwing forms are often altered, then other markings introduced to create a what is a painting on a three dimensional surface. I trained as a production thrower in the 1970s and 80s at Birkenhead Park Potteries in Wirral, making stoneware tableware. After the pottery closed I spent my time bringing up my family and working part-time as a pottery teacher. Now I am making my own stoneware and raku pots. My pots are also for sale in several galleries throughout the North West and in Yorkshire as well as in my garden gallery at home in Bidston, Birkenhead. Diane received a Degree in Art and Design from Bradford College of Art in 1987. Since then she has worked as a freelance designer/ maker, has co-owned a craft and design shop, worked as an Artist in residence at a school for several years and run textile printing workshops for the public. Her studio is in Bradford. Diane works with printed textiles using Devoré and Monoprint techniques to create one-off fabrics from which she makes scarves, wraps, and framed pieces, latterly using machine embroidery to further embellish. Her designs reflect her fascination with colour, pattern, light, rhythms and silhouettes found in the natural environment and enjoys the layering and depth that experimenting with Devoré (etched) velvet can demonstrate. Louise Pallister (b.1966 UK) received a First Class BA Fine Art/American Studies from Liverpool University/LIHE (1987) and an MSc Historic Conservation from Oxford Brookes University (1991), then an MA Fine Art at City and Guilds of London Art School, graduating with Distinction in 2014 and was awarded the Slaughterhaus Print Prize, was included in the Collyer Bristow graduate exhibition 'Exceptional' and her essays on the influence of nature on her practice published by the journal The Learned Pig. Pallister’s work involves aspects of drawing, printmaking, and film to point to the absence of elusive, extinct or endangered species. She uses mark making to acknowledge both a widely shared familiarity with animal others and the unknowability that divides us. Species’ and individual histories inform the direction of Pallister's work but drawing is the fundamental means of information gathering and understanding. Using the positive act of mark making she describes the negative states of disappearance and extinction. Images are formed, drawn and erased, wiped, subtracted, transformed; layers revealed or obscured; movement implied. Their feral traces are visible in areas of negative space or smudges of charcoal and ink. Activating the drawing through stop motion film describes a process that fluctuates between adding and removing, a narrative from manifest to extinct, "there" to "not there". In printmaking the use of images in series that repeat, fade or are disrupted, refers to the imprint of an animal, its mark, and to the impression left. Colin Wilson and Sarah Morehead are Messer’s Wilson and Benn since 2008. Colin graduated as a mature student from Northumbria University as a 3 Dimensional Designer working in Furniture and Fine products. His previous life skills as a Time Served Apprentice saw him travel to far-flung places. He wittingly describes himself, with a glint in his eye, as an industrial gypsy. Sarah graduated from De Montfort University as a Fashion and Textiles Designer. Again no stranger to traveling the world and gaining valued friendships and an understanding of people and products. As a duo we explore life through design, craft, product, film, sound and people. Our personal stories evidence a mixture of Industrial and Academic Practice. Through inquisitiveness and play that we offer a collection of things that are hand made and hand crafted. Our products are carefully designed with thought to their purpose. We use our skills, knowledge and expertise in taming our materials. Many of our designs have a narrative, a history, and pay reference to past traditions that maintain a heritage or support an industry. We both source and collect the best materials from around the British Isles to carefully craft our products. All our products are designed and made on these shores that we call our home.